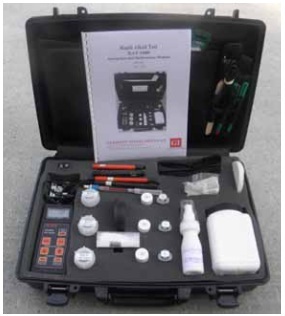 The RAT (Rapid Alkali Test) measures the amounts of sodium and potassium ions that may contribute to alkali-silica reaction (ASR) if reactive aggregates are present. ASR leads to expansive products that can cause extensive cracking in concrete structures. The alkalies (potassium and sodium ions) in the cement paste react with reactive (amorphous) silica particles in fine or coarse aggregate and cause expansion and cracking, provided sufficient moisture is present. To reduce the risk of ASR in new concrete structures, the quantity of sodium and potassium ions in the cement paste of fresh concrete should be reduced so as not to exceed the critical limit defined in the project specifications. 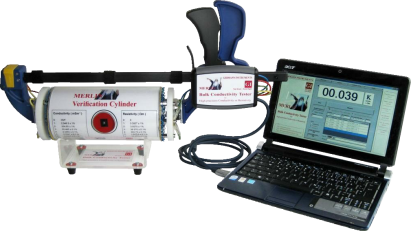 The RAT measures the amount of sodium and potassium ions in the fresh concrete or in its constituents. The test may also be used for testing powder samples of hardened concrete. A sample of the fresh concrete, or its constituents, is taken and mixed with a specific amount of acid extraction liquid. A calibrated set of electrodes, one for measuring the sodium ions and one for measuring the potassium ions, is submerged into the solution and the corresponding electrode readings (in mV) are taken. The mV-readings are transformed directly into amount of Na2O and 0.658 x K2O in kg/m3 by means of established calibration curves. The two values are added together to give the equivalent amount of total Na2O. One test takes about 10 minutes to perform after the electrodes have been calibrated. 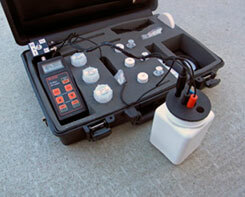 Similarly, for hardened concrete, a powder sample may be analyzed. If aggregates containing reactive material need to be excluded, a core is taken, the core is fractured, and the aggregate particles are removed. The remaining material is then pulverized and analyzed. 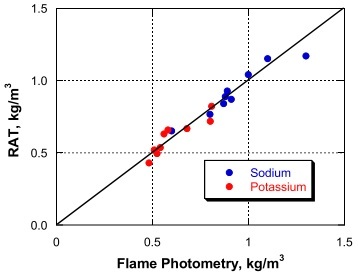 The graph shows the correlation between alkali contents determined by flame photometry and RAT, for tests performed on the same solutions prepared from different concrete mixtures. The test solutions were prepared by acid extraction of the alkalies. The correlation coefficient for these results is 0.97 and the alkali contents determined by RAT are within 5 % of the values determined by flame photometry. Calibration of the electrodes is performed using three calibration liquids. Typical calibration curves as indicated in the above graph. The concrete sample is dissolved in the extraction liquid, and the electrodes are submerged into the solution. In this example, the mV-reading for the Na+ electrode is 12.0 mV and for the K+ electrode it is 18.9 mV. The corresponding amounts of equivalent Na20 are 0.46 kg/m3 and 1.40 kg/m3, respectively. Adding these values gives an equivalent Na2O content of 1.86 kg/m3.